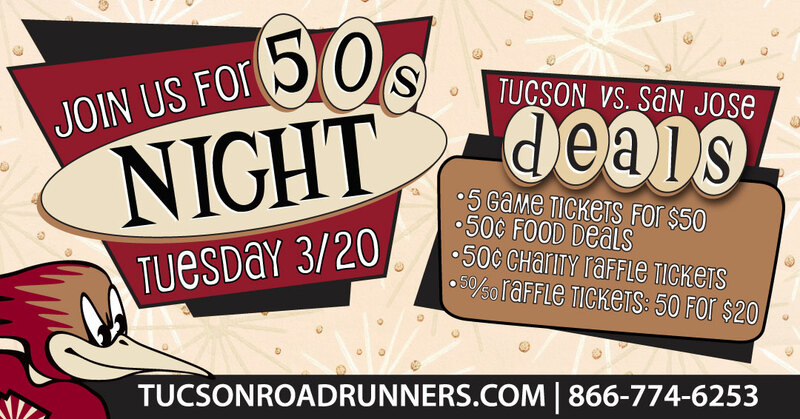 TUCSON, AZ – The Tucson Roadrunners, proud American Hockey League affiliate of the Arizona Coyotes, are set to host 50’s Night Tuesday at Tucson Arena against the San Jose Barracuda. Beginning with a special ticket package featuring five “Sides” section seats for just $50, fans can enjoy the evening with a savings of over $60 on their seats. When inside, a variety of food items will be available for just 50 cents at concession stands over the course of the game. Additionally, charity raffle tickets for the evening will be just 50 cents, in comparison to the standard $5. Tuesday’s raffle will be for an authentic team-signed jersey, with all proceeds benefitting Roadrunners Give Back. 50/50 raffle tickets can be purchased for a special price of 50 for $20 throughout the night as well. Puck drop is set for 7:05 p.m.
To purchase your seats, contact the Roadrunners at 866-774-6253. For more information on the club, visit the team’s offices at 175 W. Broadway Blvd. in Tucson.